Scroll to the bottom of the Templates page and click Create New Test. Select whether you would like to create a Subject Line Test or an Email Content Test. 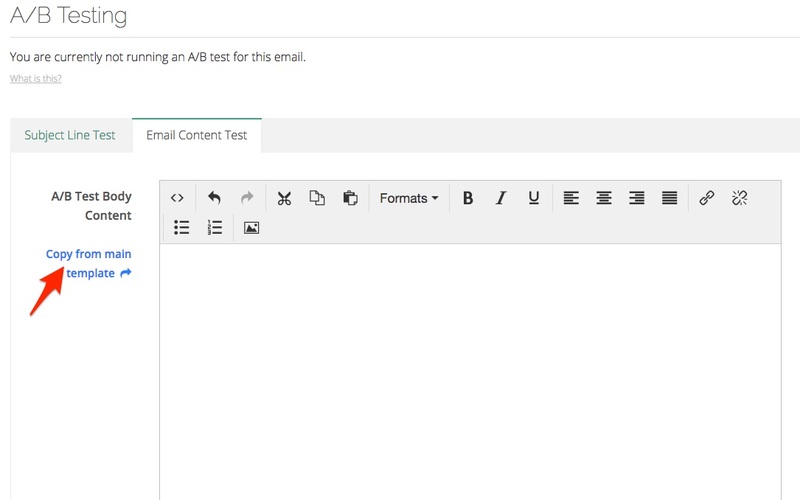 Fill in your new subject line or email content, then click Create & Start Test. 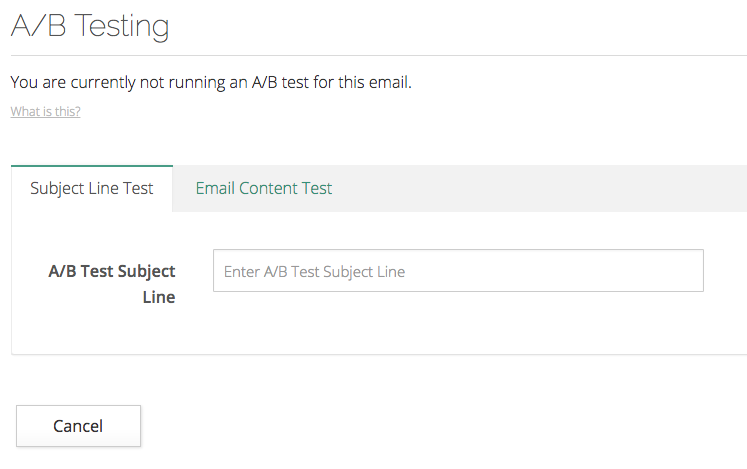 If you'd like to tweak your email template for an A/B test, click "Copy the main template." Click and type directly on the template to edit the text. 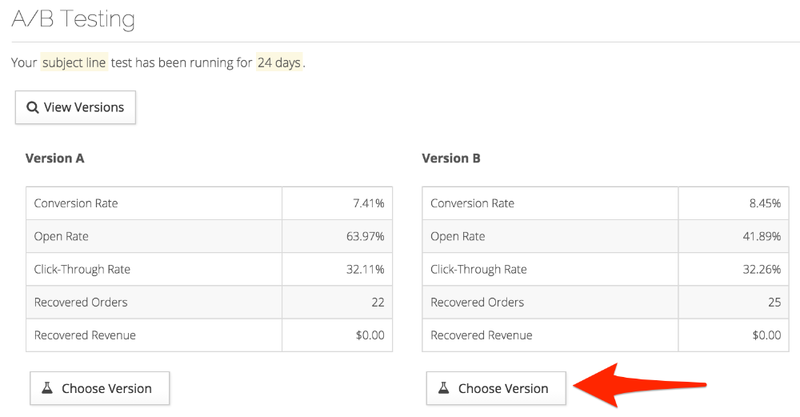 Once you've run your test for a few weeks, use the data you've collected to choose the best version of your email to grow your conversion rate. We recommend using a support tone in the first email. For the second and third email, messages that communicate benefit to a customer or create a sense of urgency are more likely to be opened. Be sure to know your audience and stay true to your brand, whether it's chic or silly. The headline of your email is the first thing your customers will see after opening your email. Be sure it's consistent with your subject line. For example, if your subject has a support tone ("Oops, did something go wrong with your order?") your headline should too ("Is there something we can do to help?"). Try using different photos to determine which ones are most eye-catching for your customers. Don't forget, it's possible a photo might not load correctly for some email clients, so don't depend entirely on photos to get your message across to communicate your message. Try varying the length of your email. Are your customers more likely to click an email that's short and sweet, or one that takes the time to paint a picture, tell a story, or tap into their personal experiences? Having too many or too few links in your email can affect your customers decision to click through. Try varying the number of links you include, and be careful to make only one clear call to action. Check out our example email campaigns for more ideas! Try changing one or two words or vary the length, rearrange the order of the words, change the offer you're making, or add personalization such as the customer's name. Not sure where to begin drafting up new email subject lines? Check out our guide to writing effective subject lines for ideas! Not sure if you should run a subject or email content test first? We recommend optimizing your subject line first. Once you've got people opening your emails, then you can start optimizing your email content. Focus on one variable at a time to get valuable data from your test results. For example, if you change the subject line, leave the email content the same. 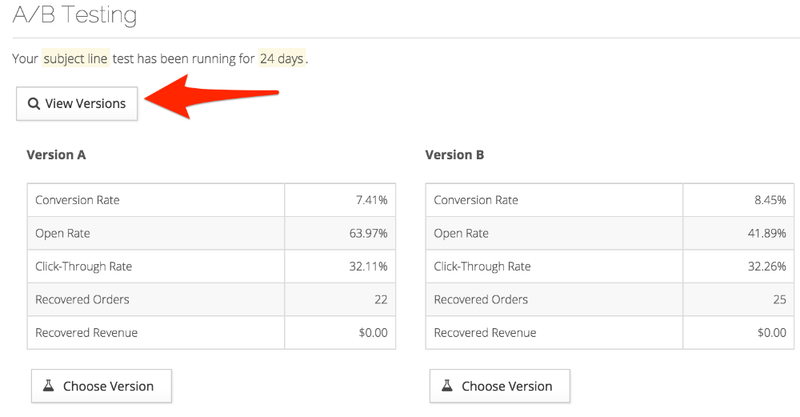 The amount of time you run your A/B test is totally up to you. If you have the Medium plan, we recommend running the test for 4-8 weeks. If you have the Large plan or bigger, we recommend 2-4 weeks. Stop your test whenever you'd like, depending on your results. There's no one perfect way to run an A/B test. The best approach is to just go for it and tweak your emails as needed!